The Chiropractor’s Protégé: The Untold Story of Oakley G. Smith’s Journey with D.D. 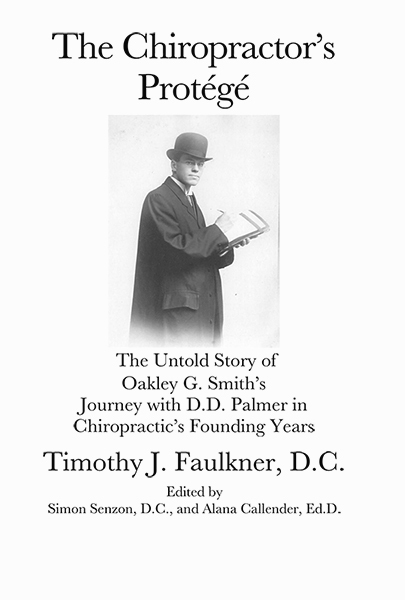 Palmer in Chiropractic’s Founding Years by Dr. Timothy J. Faulkner, and edited by Simon Senzon and Alana Callender, documents the life of one of the first chiropractors. O.G. Smith spent more time with D.D. Palmer than any other student besides B.J. Palmer. Over the course of nearly four years, Smith played an important role in the birth of chiropractic as a science. Based on Smith’s journals, letters, advertisements, and other rare documents, Timothy J. Faulkner provides a new glimpse into the earliest moments of chiropractic’s formation. Through rare photographs and first-hand accounts, many of which have never been published before Faulkner shares Oakley G. Smith with the reader. The book is a treasure and includes photos of D.D. Palmer that were found along with Smith’s journal as well as stories and anecdotes about the founder of chiropractic that are refreshing and fascinating. This book is a unique contribution to the history of chiropractic. The Chiropractor’s Protégé: The Untold Story of Oakley G. Smith’s Journey with D.D. Palmer in Chiropractic’s Founding Years by Dr. Timothy J. Faulkner, is a must have for anyone interested in the earliest days of chiropractic. Faulkner’s research and the discovery of the OG Smith papers rewrites the founding days of chiropractic and offers new insights into D.D. Palmer and his first students. O.G. smith was probably his 10th student as well as his the chiropractor’s protégé.